The Mediterranean space, defined by a major sea, a large number of littoral countries and to some extent their hinterlands, is at the same time an interface between Europe, Africa and Asia. This brings complex challenges in terms of achieving peace and stability. Recently it has received intense international attention through the internal destructiveness and spill-over from conflicts, primarily those waged in Libya, Syria and, more remotely, Iraq. 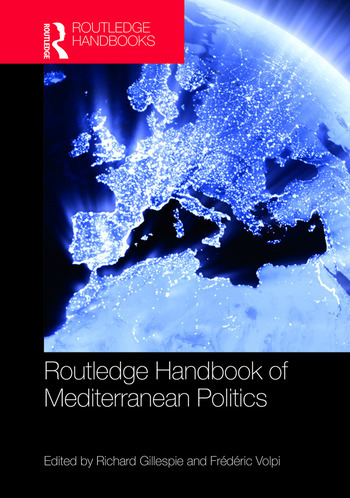 This Handbook provides an overview of the political processes that shape the Mediterranean region in the contemporary context. It explores the issues of crucial importance to Mediterranean dynamics through a series of analytical sections that guide the reader towards a comprehensive understanding of the main regional interactions and trends. The wide range of contributions from many of the leading academic experts on the region offers not only insights into the debates and processes that structure each theme, but also key pointers for a more general understanding of how distinct political, economic, social and cultural dynamics interact across the region. It will therefore be a key resource for policy-makers and students and scholars of Mediterranean politics and international relations. Richard Gillespie is Professor of Politics at the University of Liverpool and was the founding editor of the journal Mediterranean Politics. Frédéric Volpi is Senior Lecturer in International Politics at the School of International Relations at the University of Saint Andrews.